A Hudsonian Godwit has been hanging out at Fort Stevens for over a week now. 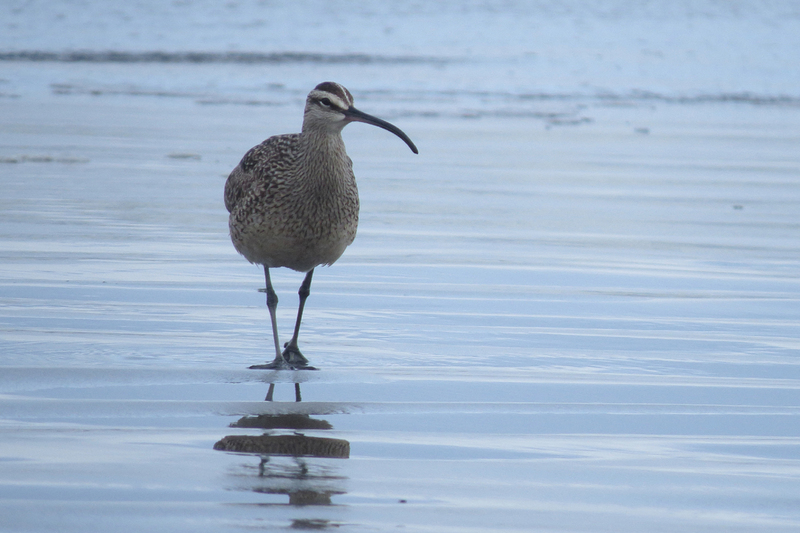 This species, seen here with a Black-bellied Plover, normally migrates through the central part of the continent so an appearance on the west coast is a rare treat. Here is a glimpse of the bird’s white rump, one feature that helps separate it from the expected Marbled Godwits. 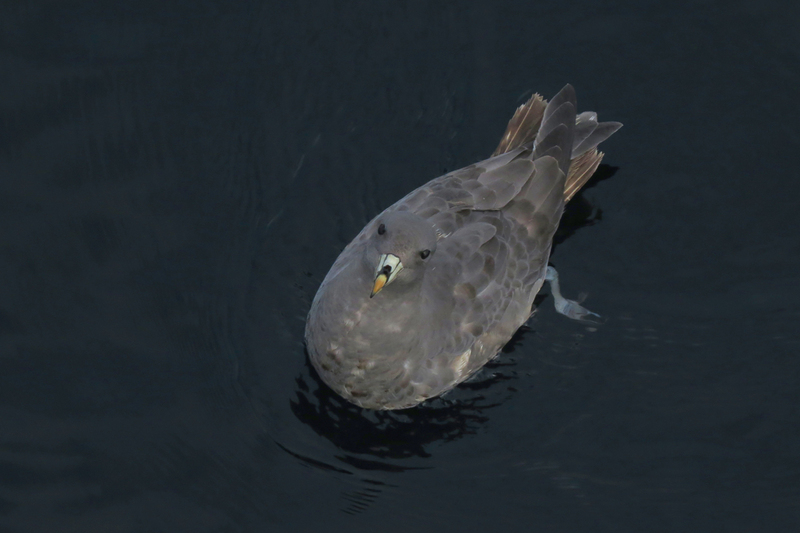 Other differences include the gray-brown coloration, dark underwings, bold wing stripe, and obvious pale supercilium. Note how much yellow is present on one of these Black-bellied Plovers. This is apparently quite common on young Black-bellieds, but this is the first year I have seen it. These birds can be mistaken for American or Pacific Golden-Plovers at first glance, but the bulkier shape, thick bills, and different calls all point to Black-bellied Plover. and Western Sandpipers. Notice the tiny bill on this individual, suggesting that the bird is a male. 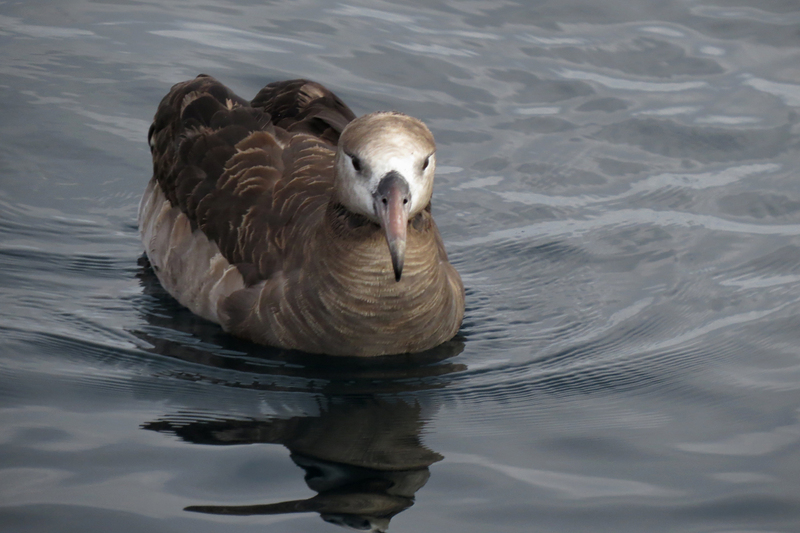 I went on the deep water trip organized by Oregon Pelagic Tours. 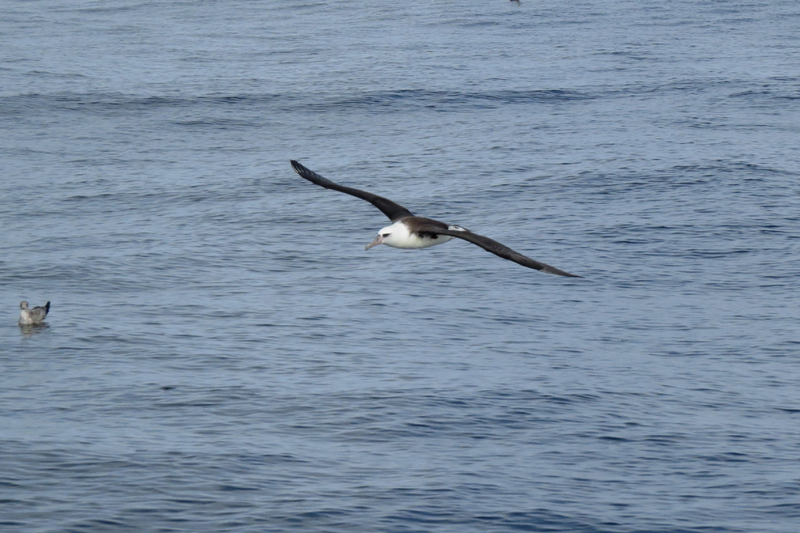 The goal of this trip was to get 50 miles offshore to explore some deeper water (6000 feet). There are a few species of birds our there that are not often seen closer in, so I had hopes of picking up a new bird or two. 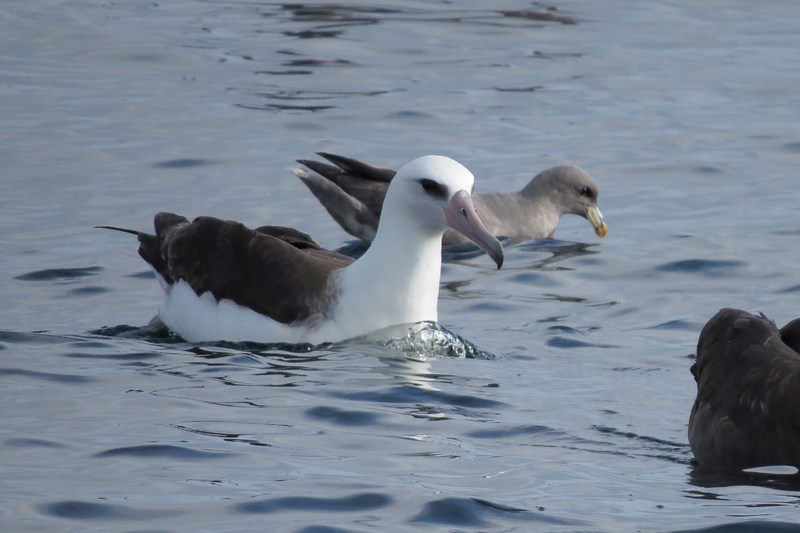 We struck out on the deep water specialties, but we saw so many great birds on this trip that it was hard to be disappointed. 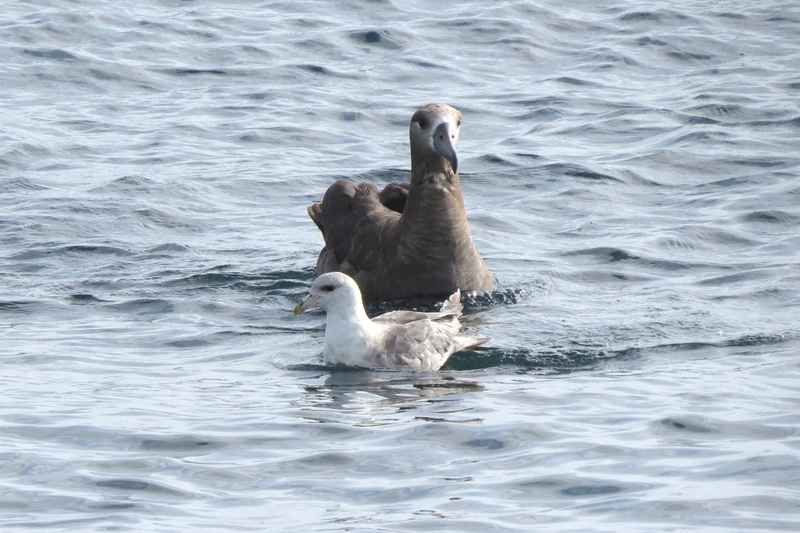 Northern Fulmars were one of the more common species seen on the trip. They come right up to the boat to beg for food. 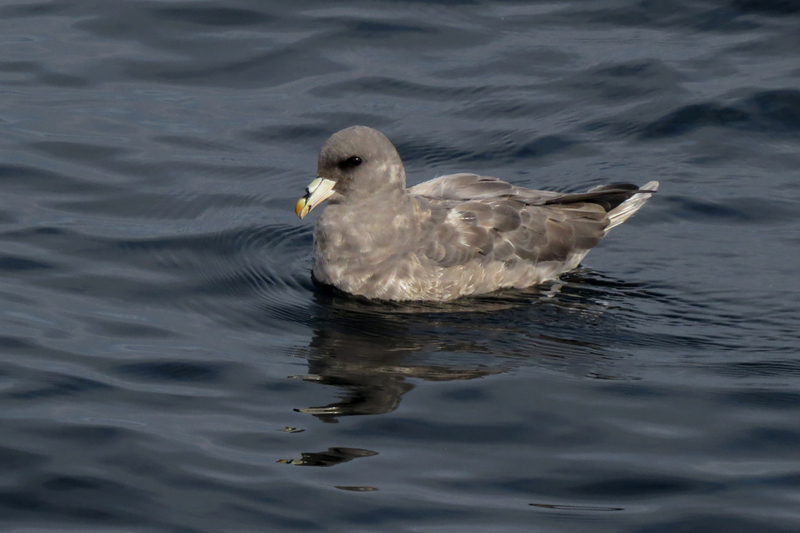 Most of the Northern Fulmars seen off the Oregon Coast are darker birds like this one. 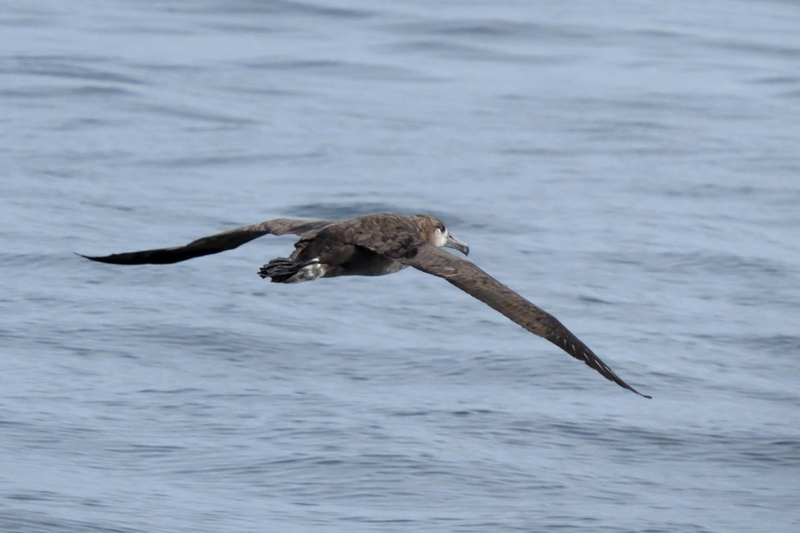 Black-footed Albatrosses are also extremely common once you get about 30 miles offshore. 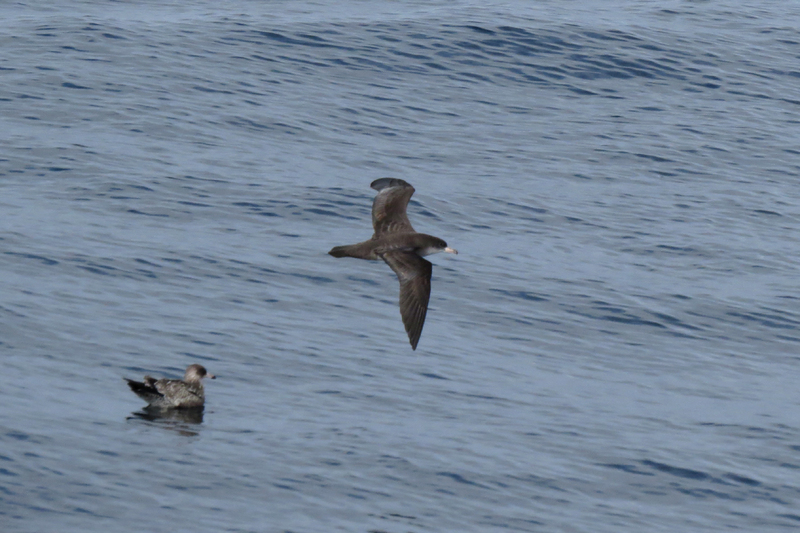 Pink-footed Shearwaters are another common species on many trips. They fly by the boat but tend to not rest on the water too close. 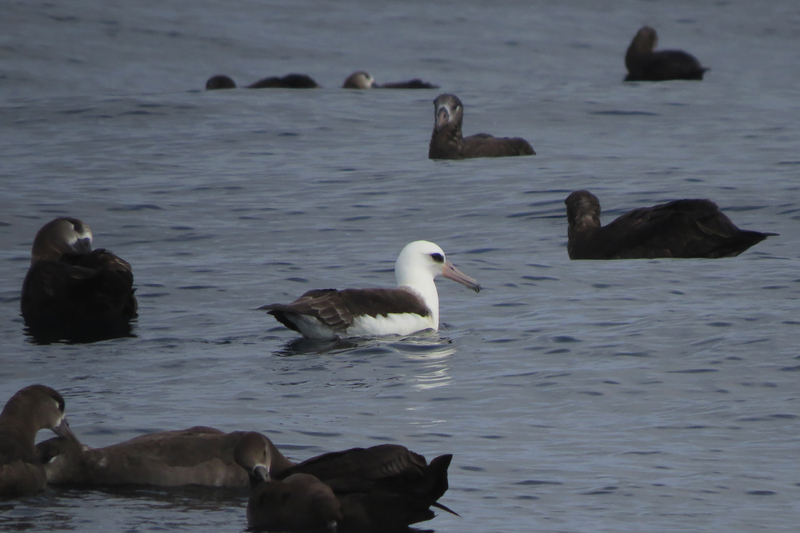 Among the 700 or so Black-footed Albatrosses we saw on this trip were three Laysan Albatrosses. 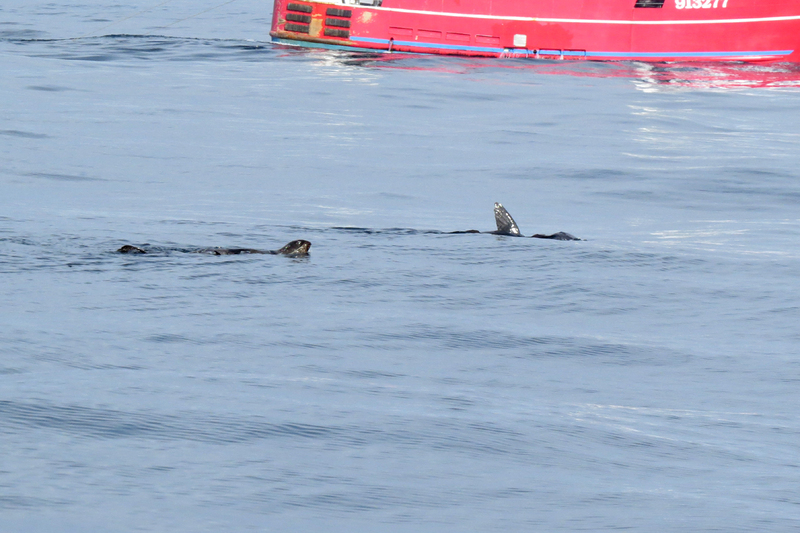 The calm waters allowed us to see many Northern Fur Seals, recognizable by their habit of sticking their large pectoral fins out of the water. Twelve hours on the water made for a long day. I spent the entire trip along the front rail looking for birds, because if I let my guard down at any time, that is when the mega-rarity will show up. 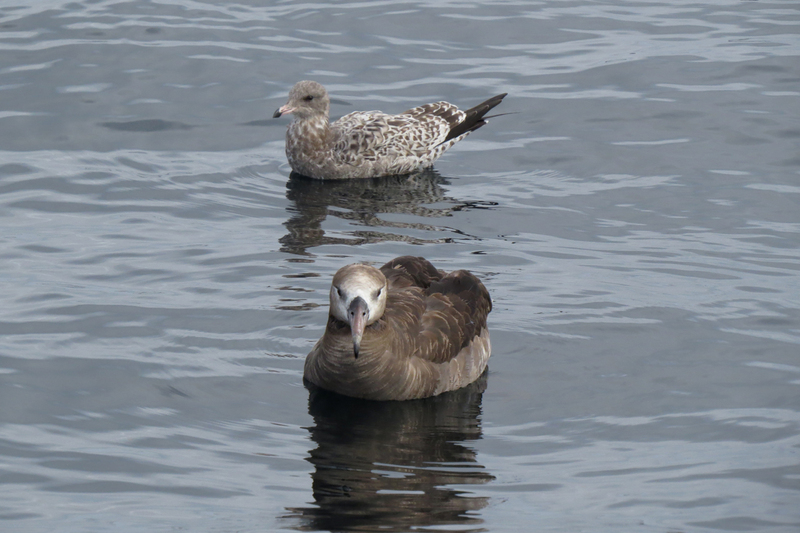 Even if you don’t get a new bird, the common species, along with other marine wildlife, always make a day on the water worth the effort. 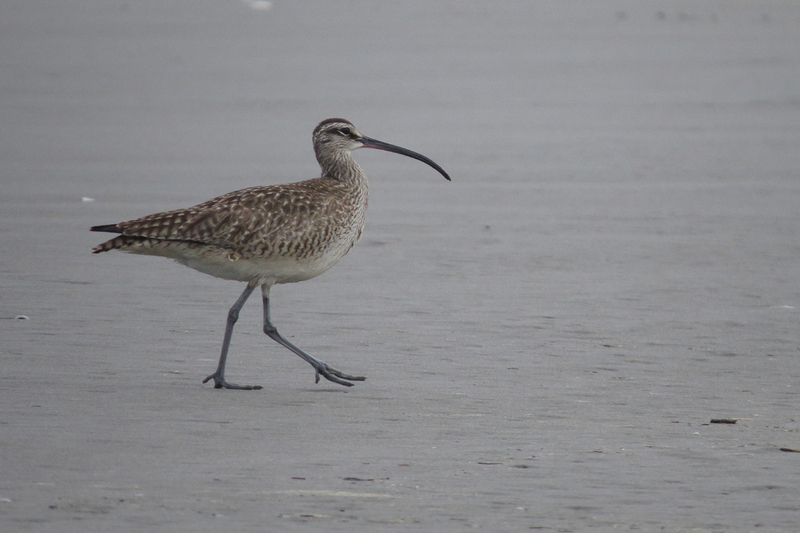 There isn’t much going on bird-wise in mid-summer besides shorebirds. It is nice to have an opportunity to really focus on a single group of birds. Here are a few images from recent weeks. This Long-billed Dowitcher, to the right of the Killdeer, really caught my eye since she was still in nearly pristine breeding plumage. The bright cinnamon color goes all the way down through the undertail coverts. This bird was at Jackson Bottom Wetlands. 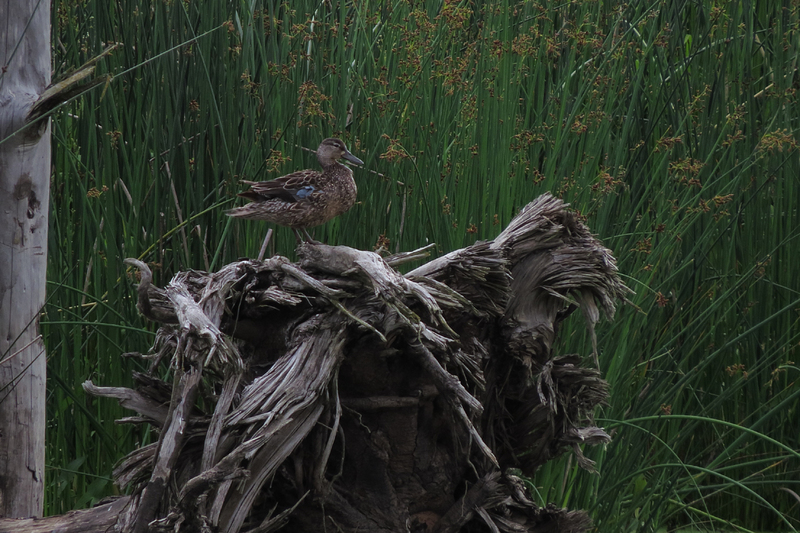 more Long-billed Dowitchers at Jackson Bottom. These birds are already fading into their duller winter plumage. From the cuteness department comes this fuzzy baby Killdeer. Seeing a young Killdeer with his single breast band this late in the summer might suggest a Semipalmated Plover. But the fluffy plumage and the long legs (not to mentions the tiny wings) let us know we are looking at a fledgling. 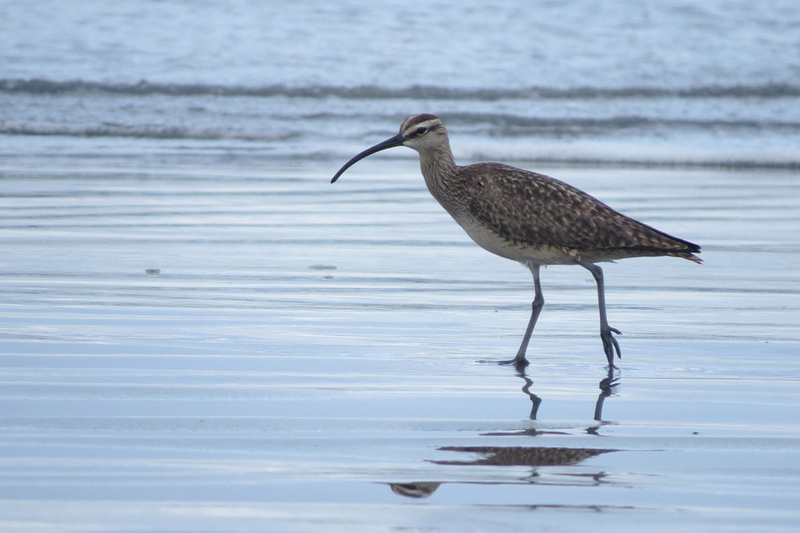 Take the time to look at shorebird specimens whenever you have the chance. The first thing you will notice is just how small these birds are. 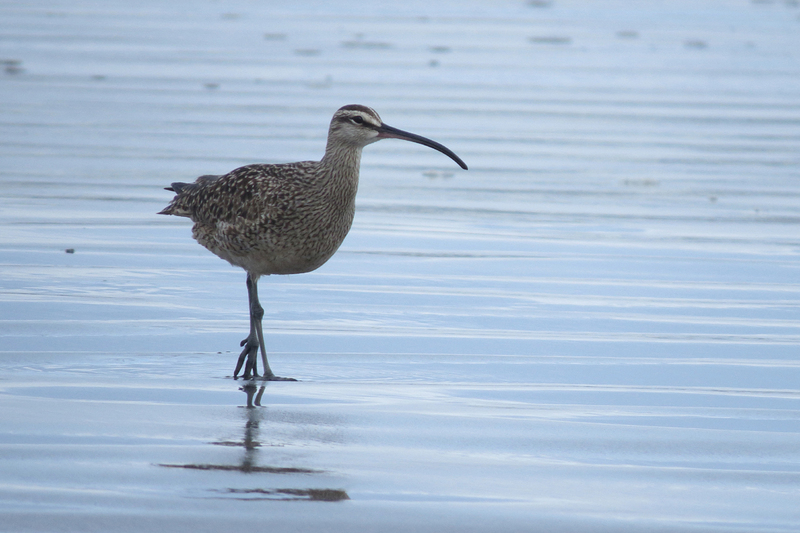 Since we usually look at shorebirds through powerful optics, we tend to think they are actually larger than they are. (A Least Sandpiper is a little smaller than a House Sparrow.) Here we have a nice comparison of a Greater and a Lesser Yellowlegs. Note the differences in the proportions of the bills. A trip to the coast provided good numbers of Semipalmated Plovers, seen here with a Western Sandpiper. Several hundred Marbled Godwits spent a couple of weeks at the beach in Fort Stevens State Park. Dragonflies provide a nice burst of color in the summer. I believe this a Blue Dasher, but please correct me if I am wrong. This Black-tailed Deer was behind the visitor center at Jackson Bottom. Shorebird migration will be the big thing for another few weeks, but it will be gull season before you know it. 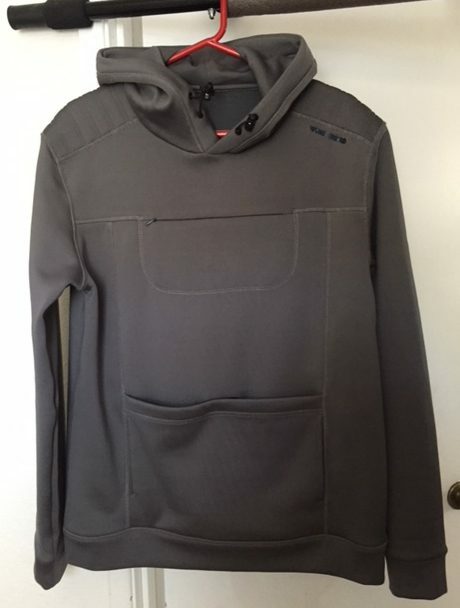 I had the opportunity to try out two pieces of birding apparel from Wunderbird, a long-sleeved Tee (The Peregrine) and a hooded sweatshirt (The Gyrfalcon). The three features that set Wunderbird apart from any other outdoor apparel are high-tech fabric, top-opening pockets for bearing the weight of optics and other gear, and padded shoulders to ease the strain of carrying a tripod. I was very pleased with all three. The first thing I did with the Peregrine was to go for a jog. I have never been thrilled with “quick-dry” synthetic fabrics, but I was amazed by how quickly perspiration evaporated from this shirt. It was a good first impression. Next I wore it birding. I always wear long sleeves when birding, even in extreme heat, to protect my arms from sun and vegetation. The fabric of the Peregrine is substantial, but the breeze passed right through and kept me comfortably cool even in direct sun with temperatures over 80 degrees F. The Gyrfalcon is made of thicker, more tightly woven material. I had a chance to try it one morning when the temperature had dropped into the upper 50s F., and found it to be very comfortable even when temperatures started to rise. Wunderbird advertises that their garments repel mosquitoes. I am blessed to live in an area that doesn’t have many biting insects, so I wasn’t able to test this feature. But other reviewers have been very pleased with the fabric’s effectiveness in this regard. Each garment has two pockets in front that open at the top (I like to refer to them as kangaroo pouches) designed to take the weight of your optics off of your neck. 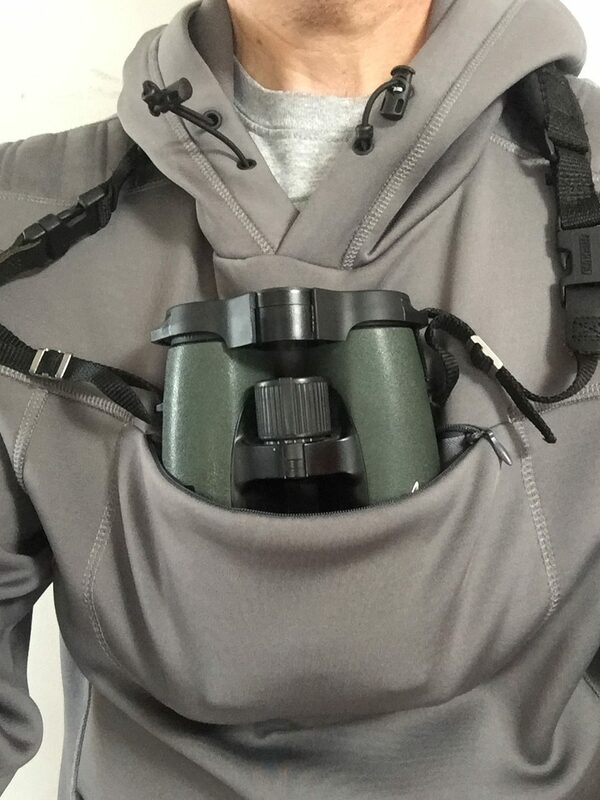 I carry my binocular fairly high, so I used the upper pocket. The pocket is shallow, so your binocular only goes in about half way. This allows for quick and easy removal when you need your optics. The lower pocket is larger, so if you are not using it for a binocular, it could carry snacks, a small water bottle, or other gear. Both pockets on the Peregrine close with a zipper. The lower pocket on the Gyrfalcon is much larger, and has a small patch of Velcro to keep it from hanging open. With my binocular in the top pocket of the Peregrine, I felt the weight distributed across my shoulder blades. This was very comfortable and actually felt like it was improving my posture. The Gyrfalcon fits more loosely, so I felt the weight of my binocular pulling down the front of the garment. But it still felt good to have the weight off my neck. The Gyrfalcon also has pockets on the sides to warm your hands. 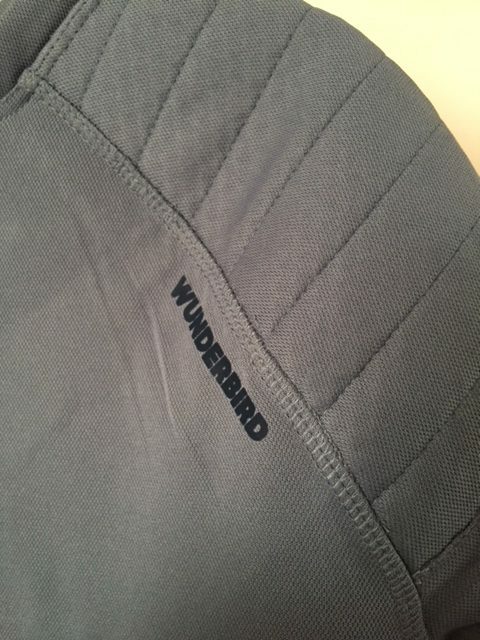 All Wunderbird garments have padding on the shoulders to make carrying a tripod more comfortable. While the padding can’t do much to mitigate the weight of a scope, it does help to protect the skin from bruising, especially if you have bony shoulders like mine. I also carry a small camera bag over my shoulder while birding, and the padding made carrying that lighter weight noticeably more comfortable. If I had worn the Peregrine under the Gyrfalcon, I think that would have been even more effective. 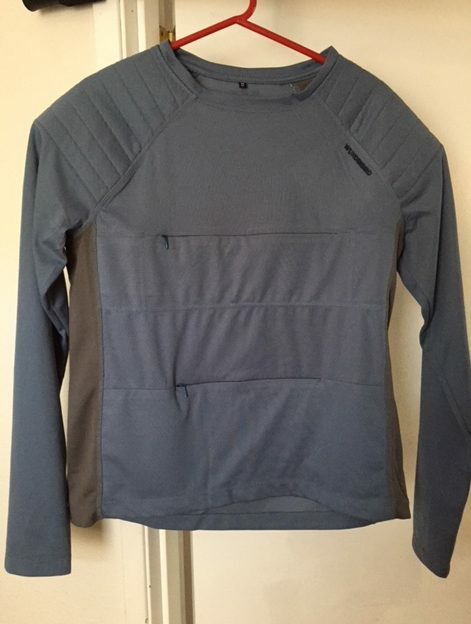 The first time I wore the Peregrine, either the stitching or the edge of the padding felt scratchy on my shoulders. On subsequent trials, I wore a cotton T-shirt underneath and that seemed to fix the problem. The hood on the Gyrfalcon has three elastic chords to adjust the fit. This keeps the hood from getting into your field of view. The Wunderbird web site has a guide to help you order the right size. My measurements fell between small and medium, so I ordered medium. I found that size to be a little baggy, so if you are between sizes I would recommend ordering the smaller. I think a snug fit would help distribute the weight of your optics more effectively. Wunderbird birding garments actually do what they set out to do; they protect you from weather and other environmental hazards, they take the weight of your binocular off your neck, and they protect your shoulders from being bruised by your tripod. In other words, they make birding more comfortable so you can do it longer. What could be better than that? I visited Tualatin River NWR last week. The weather has been very hot and dry, so I started early in the morning. There was a surprisingly large diversity of species for mid-summer. I ended the trip with 55 species. I didn’t pay too much attention to waterfowl, so there may have been more. 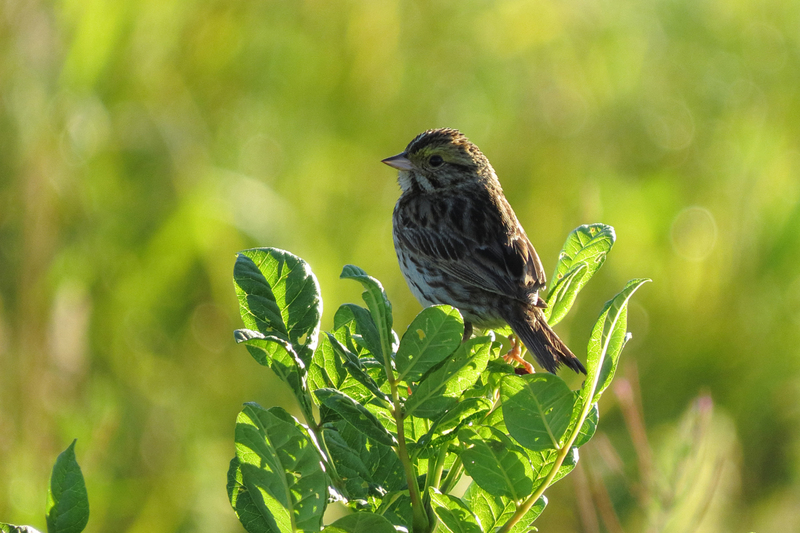 This Savannah Sparrow was backlit by rising sun. Here is one reason I don’t pay too much attention to waterfowl this time of year. There are a lot of young birds and molting adults around in Ugly Duck Season. 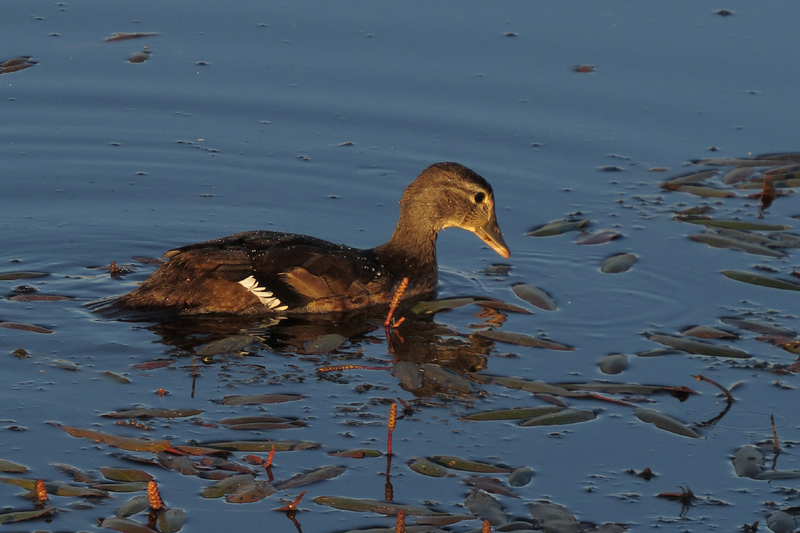 Some birders love the challenge of studying these birds, but since ducks are not migrating during their summer molt, the likelihood of finding anything other than the local breeders is slim to none. 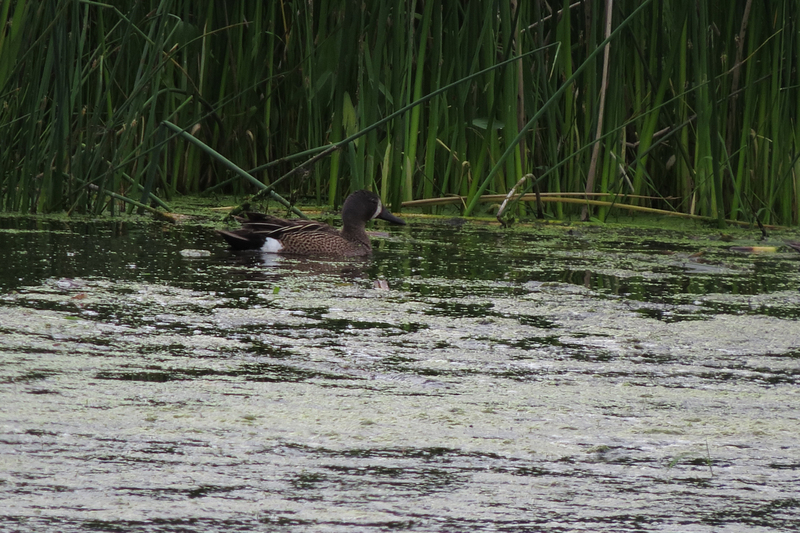 I’m calling this an immature Wood Duck, but I could be wrong. 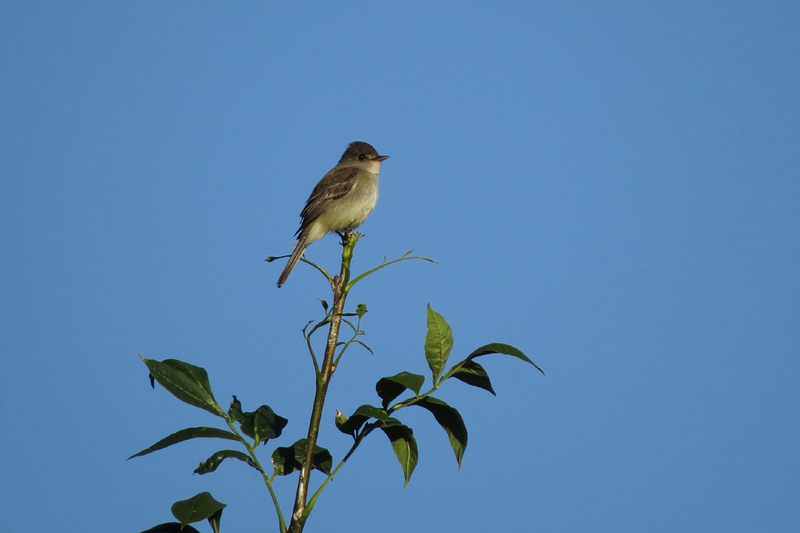 Willow Flycatchers were still singing from prominent perches. 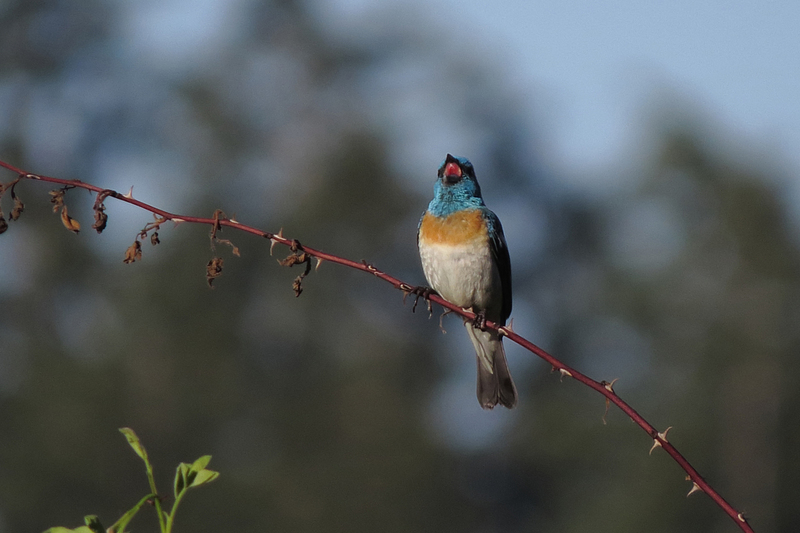 This Lazuli Bunting was singing from a little thicket. There is not a lot of shorebird habitat at the refuge right now, but Greater Yellowlegs, Least Sandpipers, and Western Sandpipers were present in small numbers along with hundreds of Killdeer. 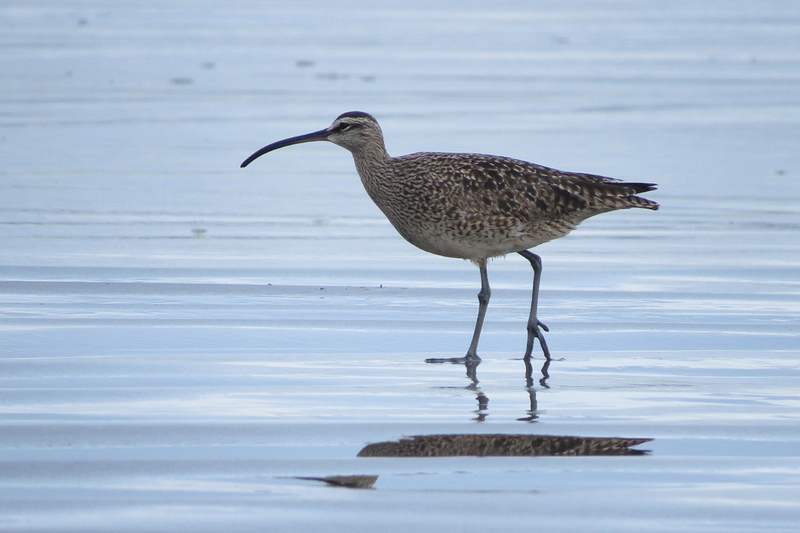 As water levels drop, shorebird numbers should increase. I spent a few hours birding above Timberline Lodge on Mount Hood. It was cold and very windy when I arrived, but conditions gradually improved. This is not a site to wrack up a long bird list. After three and a half hours of birding, I ended this trip with 12 species. The top eBirder for this site has only accumulated 33 species (I have 31). But I still try to visit at least once a year. The site is unique in that you can drive to the treeline on a paved road, and find high elevation species that you won’t find anywhere else so close to Portland. The best bird of the day was this Black-backed Woodpecker, who made a brief appearance on this isolated snag before flying back down slope to the forest. This Townsend’s Solitaire was near the woodpecker. I got two photos before the bird flew off, one blurry and one with the bird looking away. With its gravel and fine volcanic ash, Mount Hood above the treeline would look much like the surface of the moon were it not for the abundant wildflowers and the occasional Golden-mantled Ground Squirrel. There are usually a couple of Common Ravens hanging out near the parking lot. This one was feeding on an apple core. While photographers generally try to avoid harsh midday sunlight, the intense light brought out some nice highlights on this Common Raven. It was another tough day above Timberline Lodge, but there is always something to see. Nesting season continues to progress. While some songbirds have already fledged a batch of babies, other species are just getting under way. 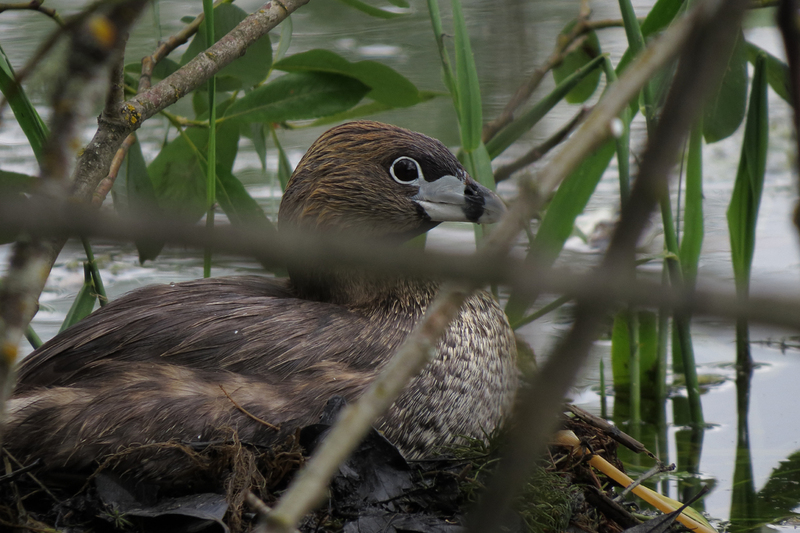 This Pied-billed Grebe was sitting on a nest at Commonwealth Lake. Blue-winged Teal can be hard to find in the Willamette Valley at any time, so it was nice to see a pair at Fernhill Wetlands. 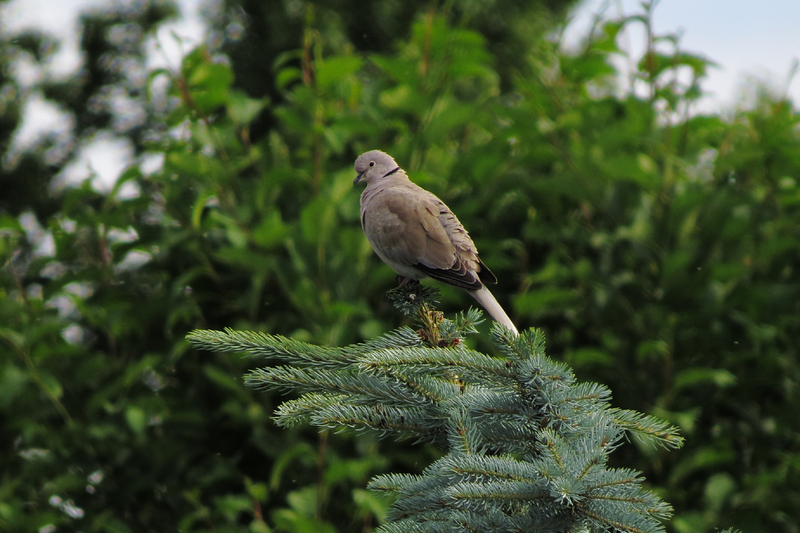 Eurasian Collared-Doves continue to expand their range and numbers in Oregon. It wasn’t all that long ago that these birds were first found in the state, or maybe I am just old. 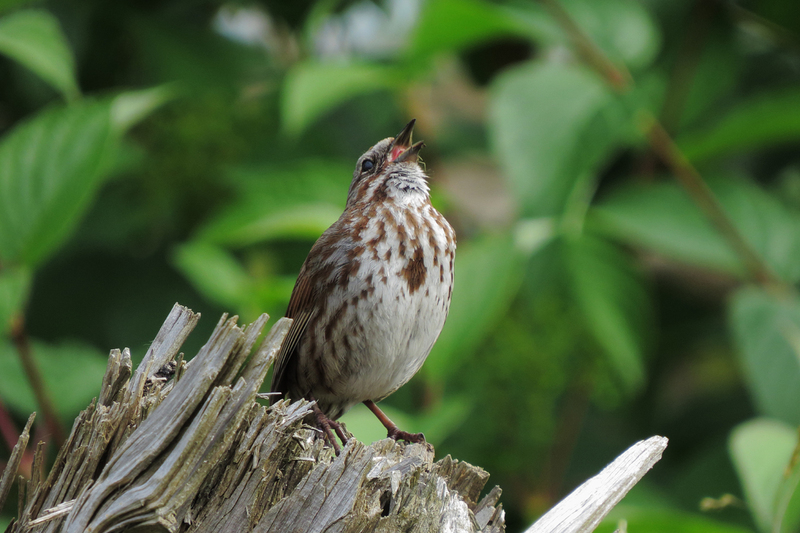 This bird was singing at Fernhill. 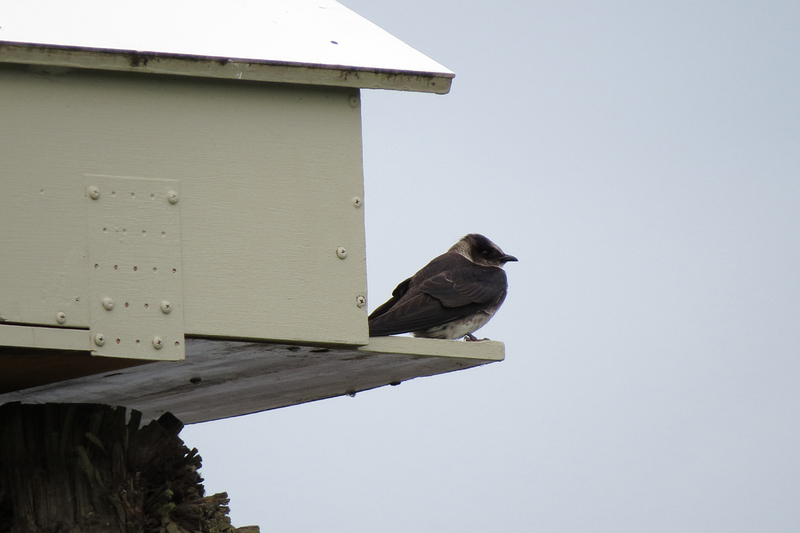 A few Purple Martins have returned to the nest boxes at Fernhill. They are still a treat to see here. While most of the Tundra Swans that winter in Oregon left for the breeding grounds long ago, this individual continues to hang out at Fernhill. 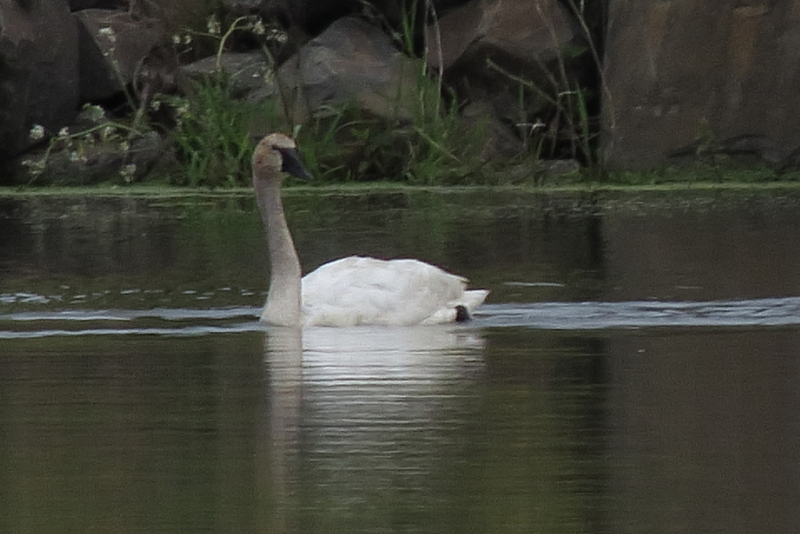 A few observers have reported this bird as a Trumpeter Swan, but the straight feathering across the forehead (as opposed to the widow’s peak on a Trumpeter) is consistent with Tundra. 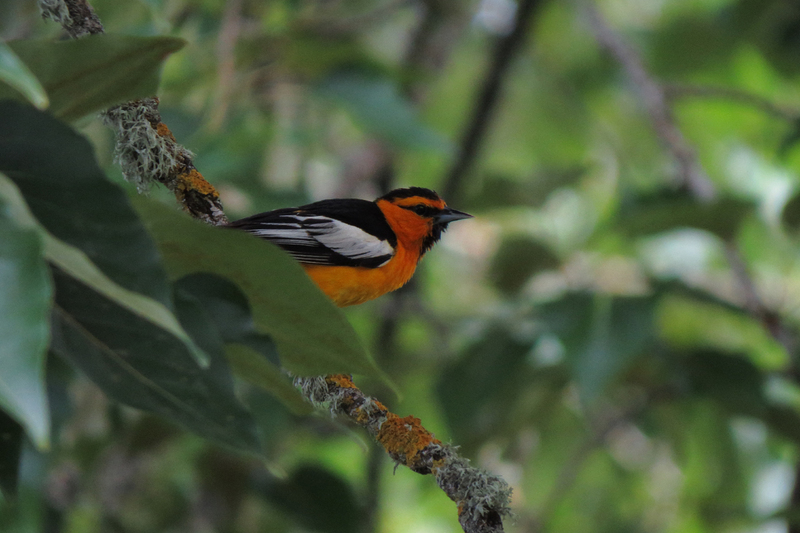 I spent a little time watching an active Bullock’s Oriole nest at Fernhill Wetlands. 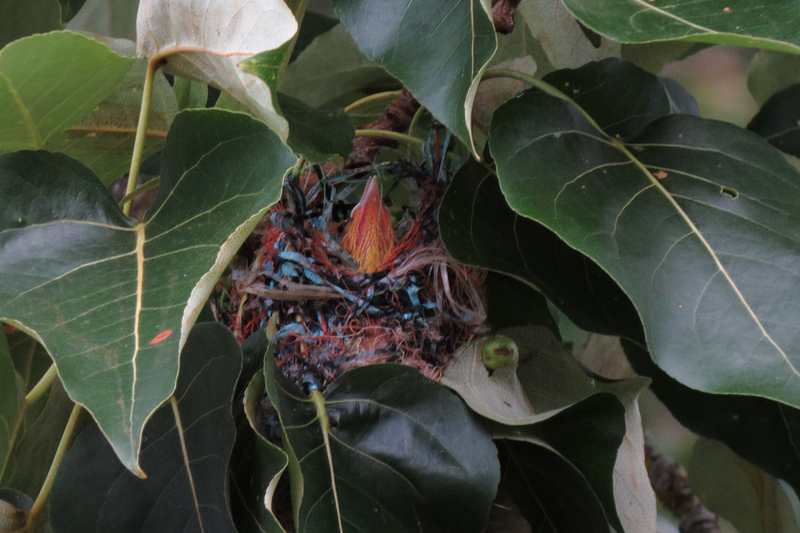 Notice how the birds have incorporated strands from a blue plastic tarp into the nest. Using plastic debris in nest construction is not unusual. 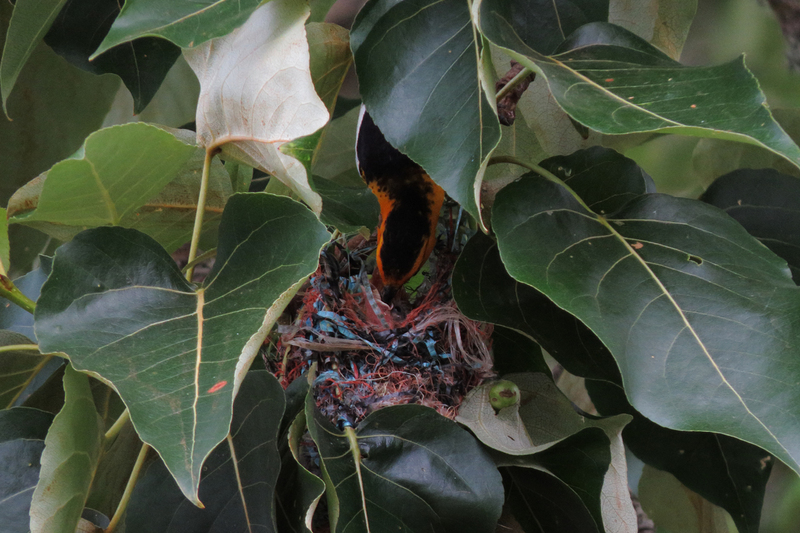 In Kansas I saw a Baltimore Oriole nest made entirely from fishing line. The plastic makes a sturdy nest, but the material can be deadly if a bird gets a foot entangled in it. 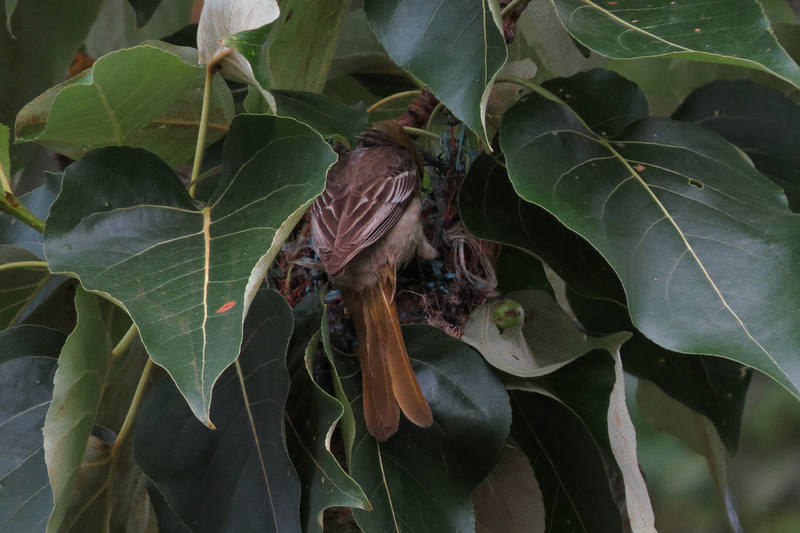 These orioles, including the baby shown here, seem to be doing alright. Here is the female feeding the babies. She was not very photogenic. Here’s Dad, feeding the babies from above. After feeding the kids, the male stopped to pose in all his orangey deliciousness. Summer is the time to slow down and study the local nesting species. Checklists can be pretty short this time of year, but the slower pace gives you a chance to really get to know the locals. This spring has seen pretty calm weather. While the sunny days may make for pleasant birding, they do not necessarily lead to great birding. 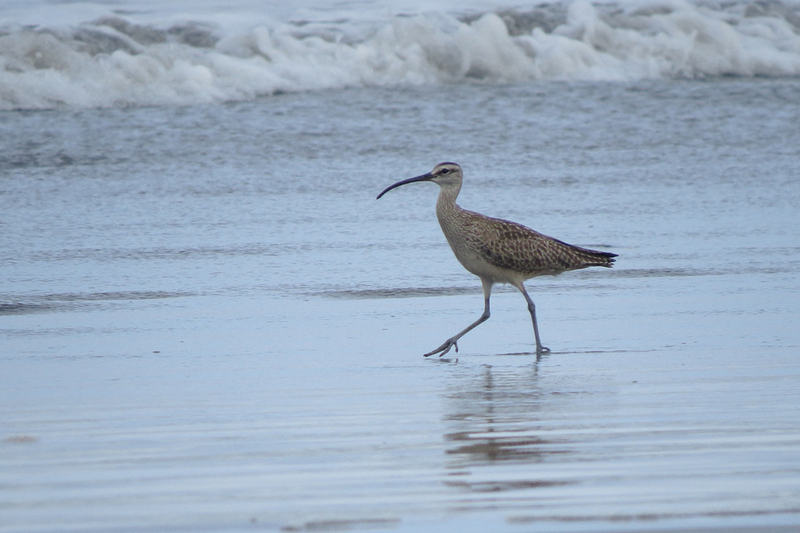 It usually takes some good storms to cause a lot of shorebirds to put down on the Oregon coast. 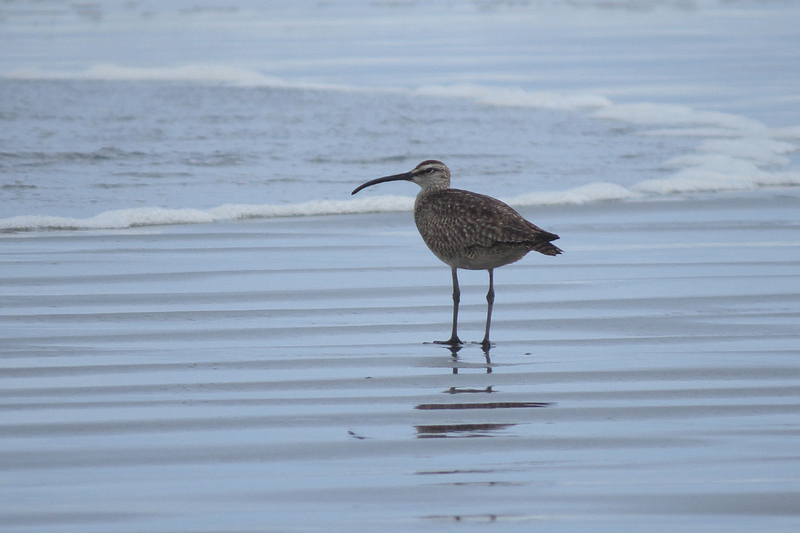 But even in leaner years like this one, we are lucky to have good numbers of Whimbrels working the beaches. 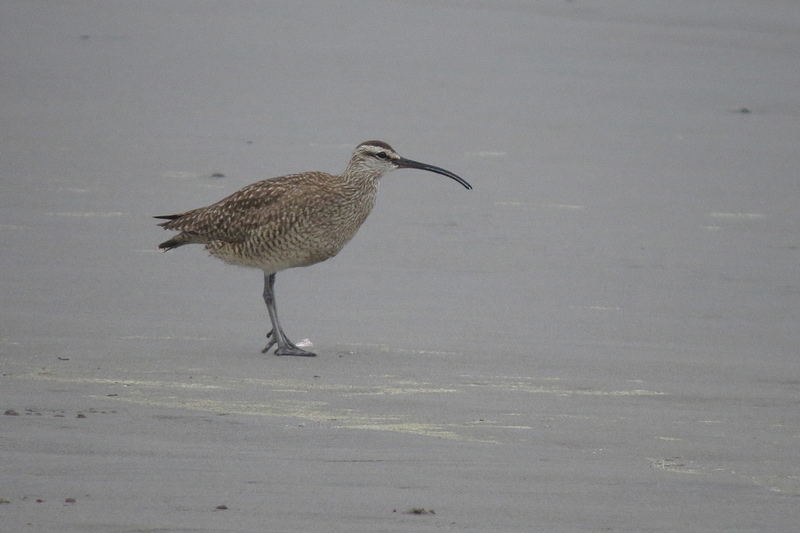 I found a flock of about 35 Whimbrels just north of the Seaside Cove and hung out with them for a while. There is a lot of individual variation among the birds; size, length of bill, and coloring. Here are a few. Spring migration has wound down, but the southbound migration starts in about three weeks so we don’t have to wait long for more shorebirds. 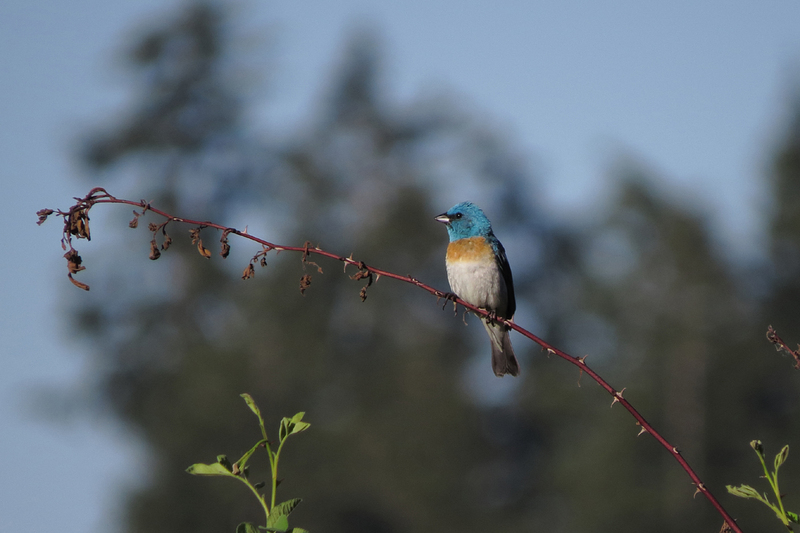 Our team for the Audubon Society of Portland’s Birdathon made a 360-mile loop through the Willamette Valley, across the Cascades, and east to the high desert. We tallied 110 species for the day. Here are a few. 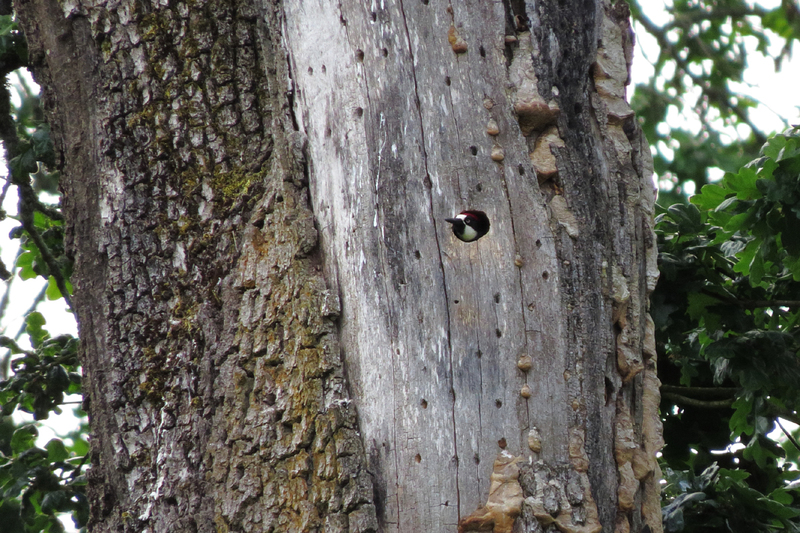 Acorn Woodpeckers are reliable near Ankeny NWR. This one was hanging out in a nest hole. 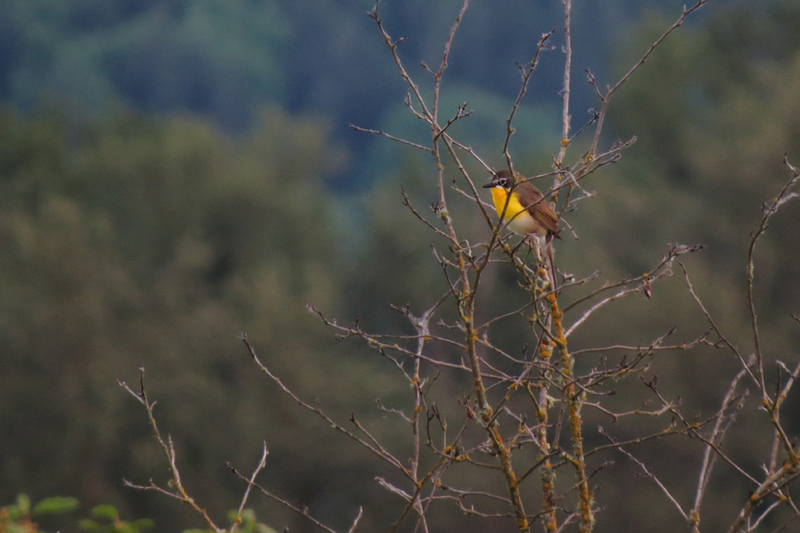 Also at Ankeny, this Yellow-breasted Chat posed and sang for us. 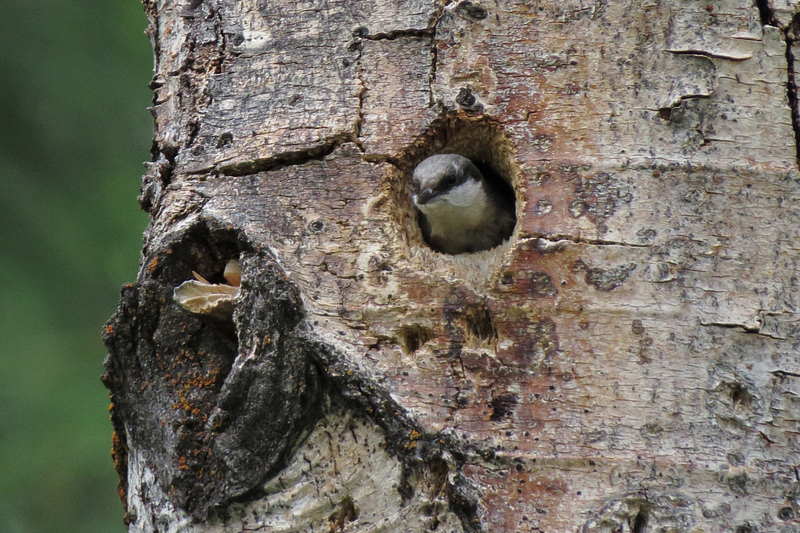 This Pygmy Nuthatch was nesting at Black Butte Ranch, just east of Sisters. Calliope Crossing, north of Sisters, came through with several examples of its namesake hummingbird. 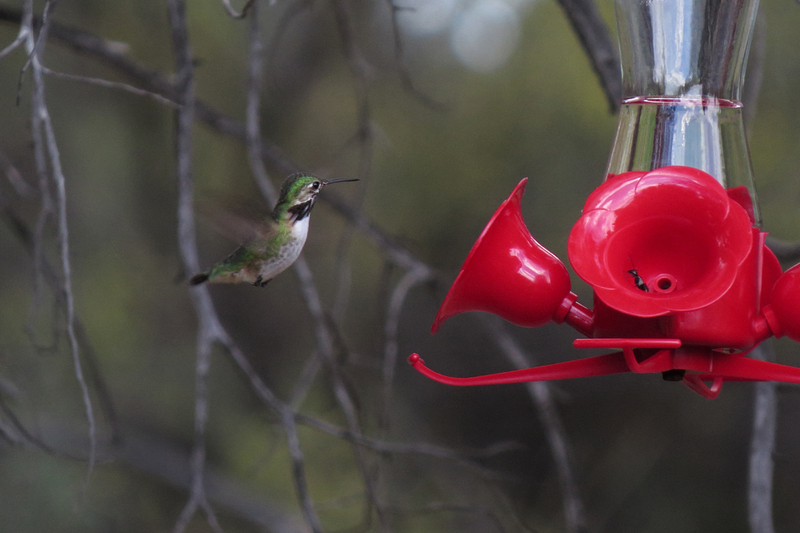 The feeder, placed by one of my teammates on a scouting trip, made watching these little guys easier. 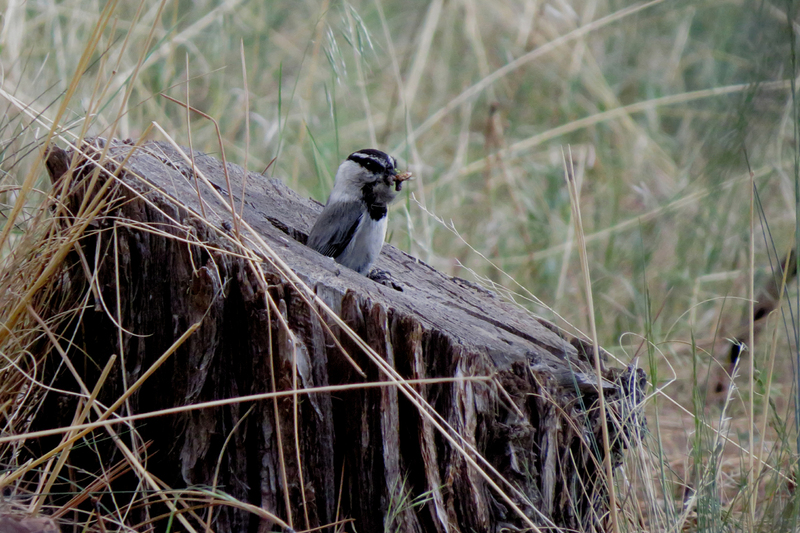 Mountain Chickadees were nesting in a hollow stump just inches from the ground. 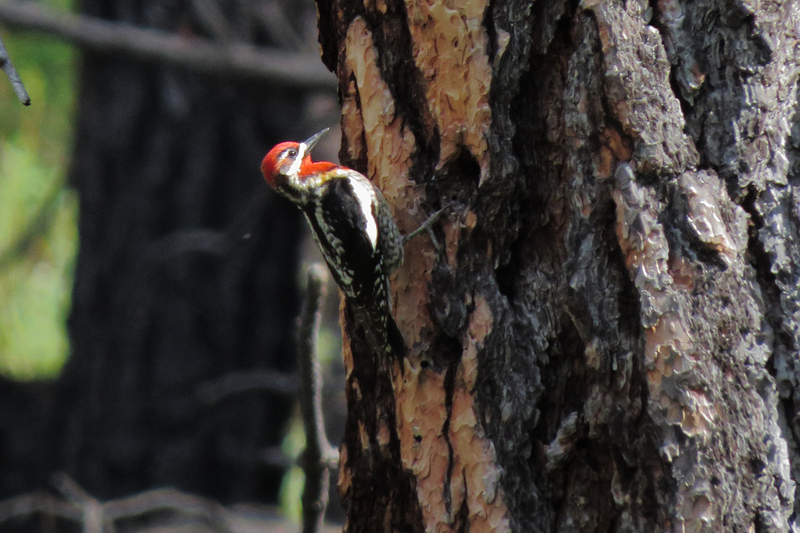 Calliope Crossing is also famous for hosting a great variety of woodpeckers. This is a hybrid Red-naped X Red-breasted Sapsucker. 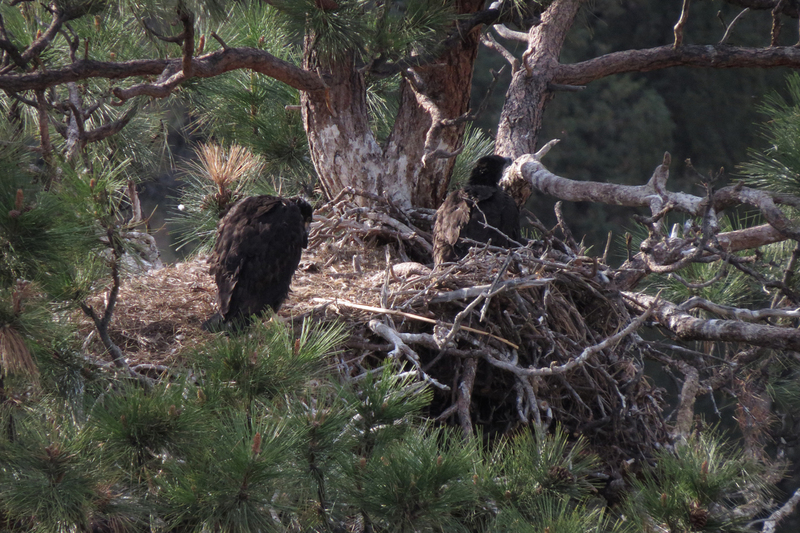 At Smith Rock, we watched this Golden Eagle nest with one downy chick. 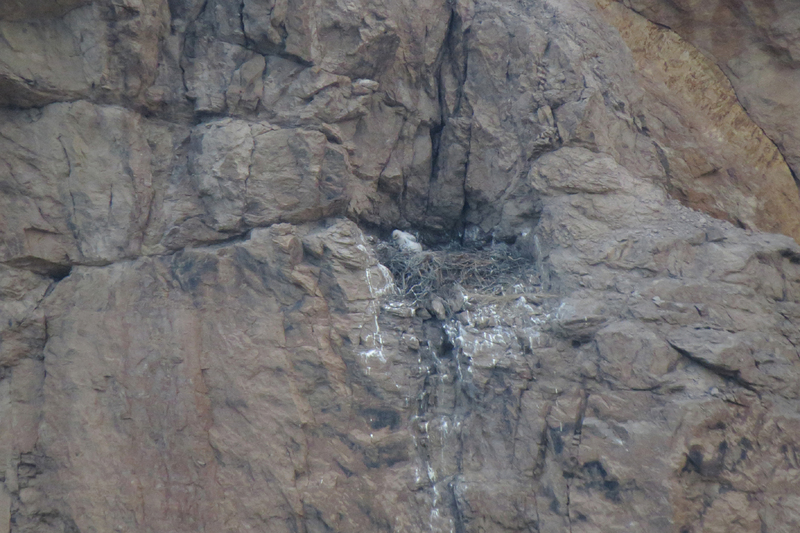 Bald Eagles were also nesting at Smith Rock. 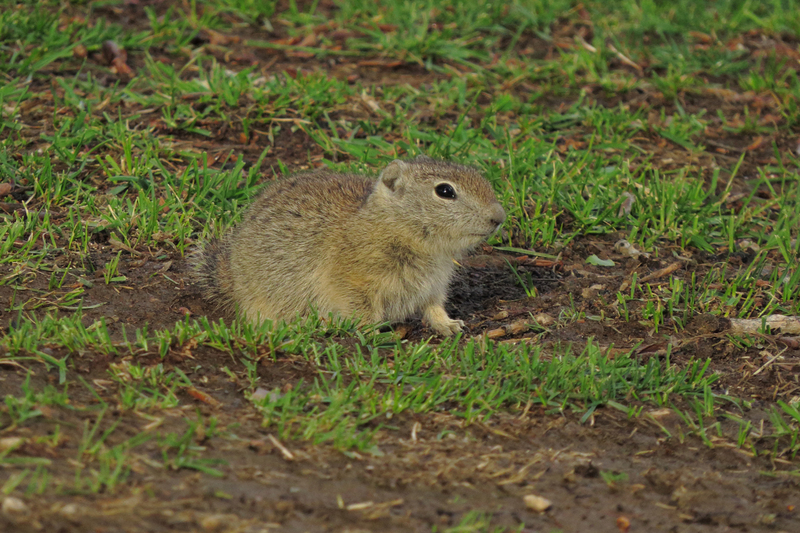 Ogden Wayside hosted a colony of ground Squirrels. I believe these are Merriam’s Ground Squirrels, although I have trouble distinguishing Merriam’s from Belding’s Ground Squirrel. I need to do some rodent research. It was a fun, albeit exhausting, day. There is still time to contribute to Portland Audubon’s fundraiser. Click here for more information.